1. All Welsh Government funded programmes to record gender of parents / carers they work with. 2. Set S.M.A.R.T. targets to increase participation of fathers and all other Non Resident Parents with Welsh Government services. 3. First Minister to make annual statement on the importance of fathers AND what the Welsh Government has done to help them in the past 12 months. 4. Encourage improved shared care of children to allow more parents (particularly single parents) to take up training or employment programmes. 5. Recognition of Parental Alienation as a form of emotional abuse of children. 6. Establish a work group under the Family Justice Network for Wales to co-ordinate improved collaboration for those organisations who hold the DWP’s Help and Support for Separated Families (HSSF) Mark in Wales. The government wants parents to agree their child maintenance agreements “amicably” or face a charge. But a charity said the changes could force some parents into “unstable” arrangements. Child maintenance is financial support that helps towards a child’s living costs when its parents have separated. The spokesman added that the old maintenance system “took responsibility away from parents, encouraging conflict and hostility at huge expense to the taxpayer”. In an effort to improve the situation the new replacement “Child Maintenance Service” has been gradually rolled out, which the government said is designed to act as a backstop for parents having trouble. Ministers want to encourage people to come to voluntary arrangements but if that is not possible – and the new statutory service is used – then both parties will be charged. Under the new rules if an amicable arrangement cannot be reached the paying parent – usually the father – will have a 20% fee added to the maintenance payment, while the receiving parent will pay 4% to get the money. However, the chief executive of the single-parent charity Gingerbread, Fiona Weir, said she was “concerned” by the reforms. She said: “While many parents are able to agree private child maintenance arrangements, for many other parents, this just isn’t possible without government help. The government says new Child Maintenance Service will use HM Revenue & Customs data to process applications and make payments more quickly than the old CSA service, thus preventing the build-up of arrears. Are you in receipt of child maintenance support or do you pay child maintenance? What’s your view on the new system? You can contact us by emailing haveyoursay@bbc.co.uk using ‘Child Maintenance’ in the subject heading. A support worker with Cardiff Women’s Aid was sacked for gross misconduct after embarking on a lesbian relationship with a vulnerable client. Cardiff Women’s Aid confirmed the dismissal after the father of the child at the centre of the custody dispute called for an investigation into the handling of the case by Cardiff council’s children’s services department. In a formal complaint to the council, the father – who cannot be named for legal reasons – claims that false evidence was concocted against him by the mother, an alleged drug abuser who has offered sexual services on the internet, with the help of the support worker. He says that as a result it took him more than two years to win custody of the child. Plaid Cymru councillor Neil McEvoy, who has been advising the father, endorsed his call for an inquiry, claiming the case backed up his belief that organisations like Cardiff Women’s Aid and Welsh Women’s Aid supported and helped clients who make false allegations. Morgan Fackrell, chief executive of Cardiff Women’s Aid, said: “Cardiff Women’s Aid has strict policies in place to protect service users and staff. Furthermore CWA considers any crossing of professional boundaries between its staff and its services users as a matter of gross misconduct and when necessary CWA has acted quickly and resolutely to address such behaviour. “CWA has had to dismiss a member of staff for such gross misconduct and as an organisation we expect the highest ethical behaviour for our staff. Cardiff Women’s Aid exists to support women and children who are on a journey of recovery from abusive and violent relationships. “We do not collude with women, nor would we ever encourage them, to make false claims about their experience. “We absolutely refute the allegations that we collude with women to ‘concoct false allegations’. “Cardiff Women’s Aid is working to end all violence and abuse within relationships and does not condone domestic violence in any form whoever the perpetrator may be. Cardiff Women’s Aid works every day with women and children who have experienced and are trying to escape violent and abusive relationships and we make no apology for being expert advocates on their behalf. I am disappointed that a formal complaint has never been brought to this organisation and as such we have not had the opportunity to test the evidence about false allegations that the complainant is relying on. Paula Hardy, chief executive of Welsh Women’s Aid, the umbrella body for women’s aid groups in Wales, said: “Welsh Women’s Aid is satisfied that any practice relating to inappropriate professional boundaries with our membership would be taken seriously resulting in appropriate disciplinary action, including resulting in dismissal. “It is deeply concerning for it to be implied that WWA would actively encourage our members to advocate that women should lie about their personal experiences and encourage women to lie in court or break court orders. Too many women experience domestic abuse with most cases going unreported to the police, there is nothing to gain from encouraging women to lie. A Cardiff council spokeswoman said: “Any complaints received by the director of children’s services will receive a response within 10 working days, in keeping with council policy. On average, eight per cent of British men – around 1.2million – say they have worried whether their children are their own. However, in Yorkshire and Scotland, men were far less likely to question if they were the biological parent of their children – with just three per cent admitting to having doubts. By comparison, three per cent of British women – some 460,000 – said they were unsure of who the biological father of their child is. The research – based on a YouGov survey of 5,266 parents on behalf of website DNATestingChoice.com – explains why more Britons are using DNA paternity testing. The findings showed clear pockets of concern in some of Britain’s cities. 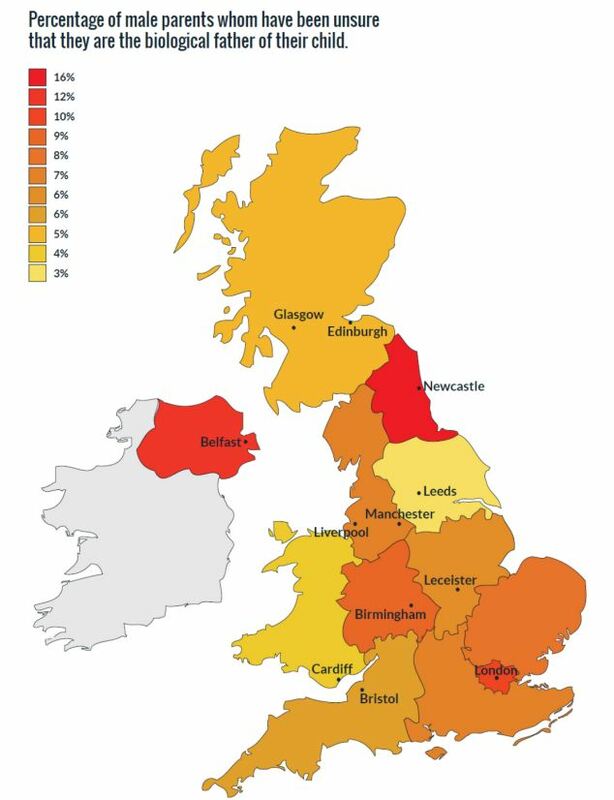 Fathers in the North East were the most likely to be unsure of male respondents representing twice the UK average. 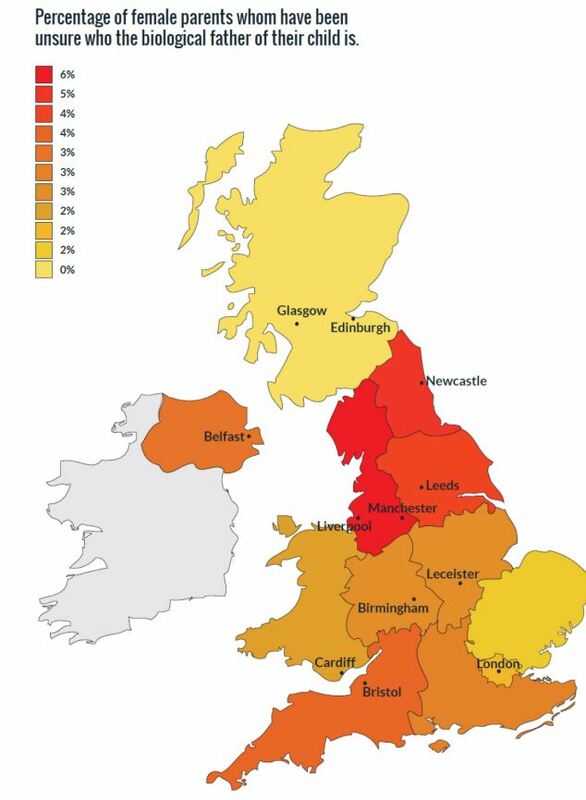 By comparison, mothers in the North West, in cities like Liverpool and Manchester, were most likely to be unsure who the biological father of their children was with nearly 6 per cent – twice the UK average – admitting they did not know for certain. Other factors including the age of the parents, occupation and marital status had a bearing on how confident they felt about their partner’s fidelity. 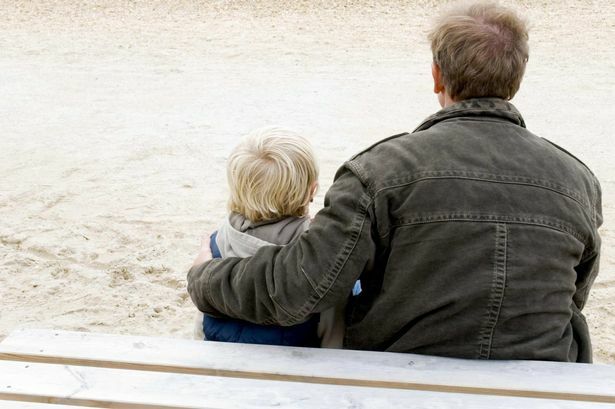 Older fathers proved to be more secure in their family structure, with just five per cent of over-55s saying they were unsure of their child’s paternity. However, the research showed that 15 per cent of fathers aged between 25-34 were most likely to have been unsure. Mothers who have never married were found to be the most likely to harbour doubts about the paternity of their child. Around eight per cent – three times the national average- of unmarried mothers replied ‘yes’ to the survey. 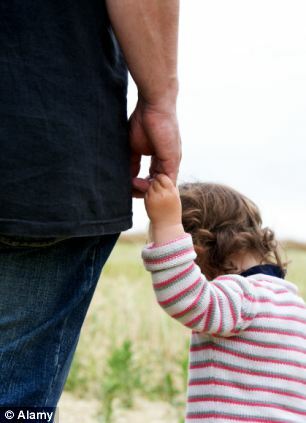 While 18 per cent of fathers who are separated or divorced said they have questioned the paternity of their offspring. 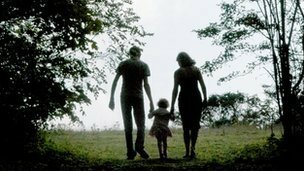 Following the publication of the Family Justice Review in November 2011, a Family Justice Network for Wales was established in May 2012.
build relationships and achieve greater coherence across agencies to improve local performance and practice. The Care Council for Wales’s website (external link) holds a number of key resources to support the training and learning of social workers in family justice. The Children and Family Court Advisory and Support Service (CAFCASS Cymru) has undergone a transformational improvement since their last inspection by Care and Social Services Inspectorate Wales (CSSIW) three years ago. The last inspection of CAFCASS Cymru in 2010 found key inadequacies in leadership and management and recommended that improvements were needed in complaints, user engagement, performance management and direct practice with children who are disabled, and where domestic violence is an issue. In their latest inspection CSSIW found that CAFCASS Cymru has improved their direct work with children and families, assessments of children who have witnessed domestic abuse, and direct work with disabled children. There has also been significant improvement in the way CAFCASS Cymru manages complaints, performance management and quality assurance. The organisation now gathers systematic feedback from service users to make improvements to services. In the last three years CAFCASS Cymru has restructured to improve management oversight and staff accountability. The quality of service it provided by CAFCASS Cymru has improved from satisfactory to good, and the leadership and management of the organisation has improved from inadequate to good. CSSIW found that the leadership of change has been exceptional with aspects of change management that serve as exemplars for other social care organisations. The most marked improvement is in the relationships with key stakeholders. The inspectors found that there is room for further improvement in the areas of case planning and recording; and equality and diversity. The participation of children and young people in planning services has also yet to be developed. The inspection found that CAFCASS Cymru is now a well regarded organisation that has an important influence on the social care sector and family justice system in Wales. The extent of change within CAFCASS Cymru and the changes bought about by the family justice reform programme have been considerable. Decisive action by CAFCASS Cymru in response to the findings and recommendations of the last CSSIW inspection report has resulted in significant improvements being made in the quality of the service they provide. The key strategic direction and vision for the organisation has been clearly articulated by the leadership, and it is evident that CAFCASS Cymru has the ability to continue to improve in the future. However, CAFCASS Cymru faces significant challenges in the near future, with a projected increase in demand for their service and changes to both public and private law. This will require the organisation to remain focused on its continued improvement journey.